This inner-city farm is changing lives in an extraordinary way. Bonton, a community in south Dallas, Texas, is probably the last place you’d think to start a farm. Photo courtesy of Bonton Farms; Stand Together. It feels like it’s been abandoned by the rest of the city. 85% percent of the men who live in Bonton have been incarcerated. Many of its residents have a hard time finding work and making ends meet. What’s worse, the lack of fresh fruits, meats and vegetables has contributed to Bonton’s skyrocketing disease rates. The men of Bonton don’t live as long as the ones who live in the rest of Dallas. Rates of stroke, cancer, heart disease and diabetes are double compared to the rest of the city. Child obesity is also a serious concern. These are just links in a long chain of problems that a lack of opportunity has created. Even though more than a million people live in Dallas, many don’t know what’s happening in Bonton. Daron Babcock was one of them. Photo courtesy of Daron Babcock. Seven years ago, Babcock says, he had “a normal career in business.” Life was going as planned. But then one day Babcock had breakfast with a friend. That friend was working with a group of men from Bonton who had recently been released from prison and were trying to get back on track. If Babcock didn’t have anything going on, his friend said, perhaps he might like to join him. Going out to the neighborhood was a turning point for Babcock. Seeing Bonton’s residents struggle was something he couldn’t unsee. He’d never known what it was like to tread water like the people of Bonton have to, but he knew he had to help. So he sold his home, left his career and moved into a house with no electricity. Photo courtesy of Bonton Farms. Because buying land in Bonton is difficult, Babcock made a deal with Habitat for Humanity: In exchange for a place to stay, he’d help keep a home secure that had recently been abandoned. The neighbors didn’t take to him at first; they didn’t trust a man who didn’t share their background. They took bets on what branch of law enforcement Babcock was in. But Babcock didn’t win anyone over with big promises or ideas. He became part of the neighborhood by admitting that he didn’t have any answers. “I just went to learn and build relationships, and so they were gracious in teaching me this stuff,” he says. What people wanted, says Babcock, were jobs. They wanted security, financial stability, a sense of ownership over their own lives. That’s how the farm began. It started with a community garden. Then Bonton’s residents were given a gift of land to grow the garden bigger by Collins Concrete. When that happened, Babcock realized that Bonton Farms was doing much more than giving people access to fresh food. Working together provided the community members with a renewed sense of purpose. Today, Bonton Farms is helping people eat healthy, start a new job, earn an income, spread their wings, and build a strong future for themselves and their community. Aside from the farm itself, Babcock has started multiple social enterprises which also employ people, and teach them what it takes to start their own businesses. “One of the things we’ve learned in working with men coming out of prison, is we have a really broken country, where not everybody has equal opportunity,” explains Babcock. 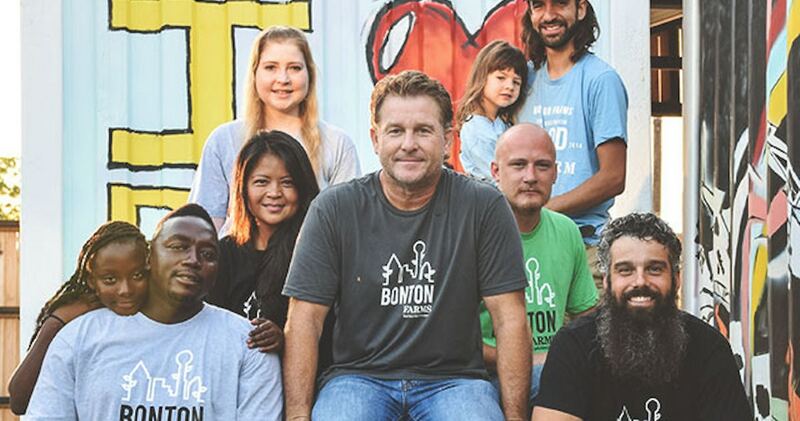 Through continued social entrepreneurship, Bonton Farms addresses this adversity that people in Bonton face and helps build solutions in partnership with the community. Bonton Farms has become a place where men and women can come when they need someone to walk alongside them while they’re recovering and figuring out the path they’d like to take. It’s a place where they can feel supported as they learn how to adjust to working. Participants may not sit in a group and discusses their pasts, but wounds are healed and new connections are made through hard work and a shared commitment to creating a better life. And the proof is in the numbers: not one person has been re-incarcerated since beginning work at Bonton Farms or one of its related enterprises. Babcock would like to see creative efforts like Bonton all across America. Stand Together is helping the community bring those dreams closer to a reality. The farm couldn’t get by without help, and it’s found an incredible partner in Stand Together, an organization that’s helping break the cycle of poverty by supporting the country’s most innovative social entrepreneurs. Thanks to Stand Together, they’re able to scale their efforts in existing communities and other places that need it. The organization provides capital, business consulting, and connections to other resources to help these entrepreneurs’ initiatives grow. Stand Together invests in solving the biggest problems facing our nation today in order to unleash the potential in every individual, regardless of their zip code. That means supporting social entrepreneurs who’re close to the problem and have developed creative solutions that are working. “New thinking” is helping Bonton Farms solve problems like poverty, hunger and joblessness. But it’s the people that are truly changing the neighborhood. It would be easy to just label Bonton Farms a success, praise the way it’s solving community problems and call it a happy ending. But that’s not how Babcock sees it. “There needs to be an understanding that the farm is the hub. It’s the vehicle that allows us to do all this.” he notes. Sometimes, he explains, people get the idea that it’s the farm work that’s the catalyst for change. It’s a beautiful story, but it isn’t true. The real change comes from the people, the connections they’re making, and the sense of hope that permeates the community when neighbors see each other flourishing. To get involved and find out which of these organizations supports your values, take this quiz here and let Stand Together do the searching for you.